Devins Sky villas & spaDevins Sky villas & spa is a popular choice amongst travelers in Bali, whether exploring or just passing through. Featuring a complete list of amenities, guests will find their stay at the property a comfortable one. Concierge, bicycle rental, Wi-Fi in public areas, 24hr room service, family room are there for guest’s enjoyment. Designed and decorated to make guests feel right at home, each room comes with kitchenette, shower, fan, ironing facilities, television LCD/plasma screen. To enhance guests’ stay, the hotel offers recreational facilities such as spa, indoor pool, garden, massage. No matter what your reasons are for visiting Bali, Devins Sky villas & spa will make you feel instantly at home. 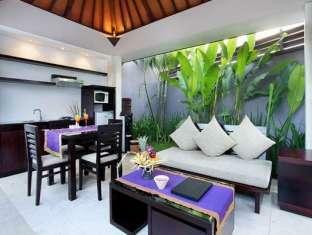 Devins Sky villas & spa is a popular choice amongst travelers in Bali, whether exploring or just passing through. Featuring a complete list of amenities, guests will find their stay at the property a comfortable one. Concierge, bicycle rental, Wi-Fi in public areas, 24hr room service, family room are there for guest’s enjoyment. Designed and decorated to make guests feel right at home, each room comes with kitchenette, shower, fan, ironing facilities, television LCD/plasma screen. To enhance guests’ stay, the hotel offers recreational facilities such as spa, indoor pool, garden, massage. No matter what your reasons are for visiting Bali, Devins Sky villas & spa will make you feel instantly at home.